Jack Reacher won’t be the only “Jack” Tom Cruise will be playing in the near future, as revealed in the international trailer for his next big budget sci-fi flick, Oblivion. In Oblivion, Cruise plays Jack Harper, one of the last humans on earth after an alien invasion that destroyed half the planet. With most everyone evacuated, the remaining humans there act as a “clean-up crew” to extract precious resources from the dying planet. Although their mission on earth is almost over, it doesn’t look like Jack will be making it home (wherever that may be now that earth isn’t it) anytime soon. When Jack decides to help a downed spacecraft, he falls head first into some sort of conspiracy that places him in the middle of humanities fight for survival. Also starring in the film is Morgan Freeman, who looks to be playing an underground leader of the humans that never left earth when everyone else was evacuated. Oblivion is based on the graphic novel of the same name written by the film’s director, Joseph Kosinski. Kosinski started his directing career with Disney’s TRON: Legacy. 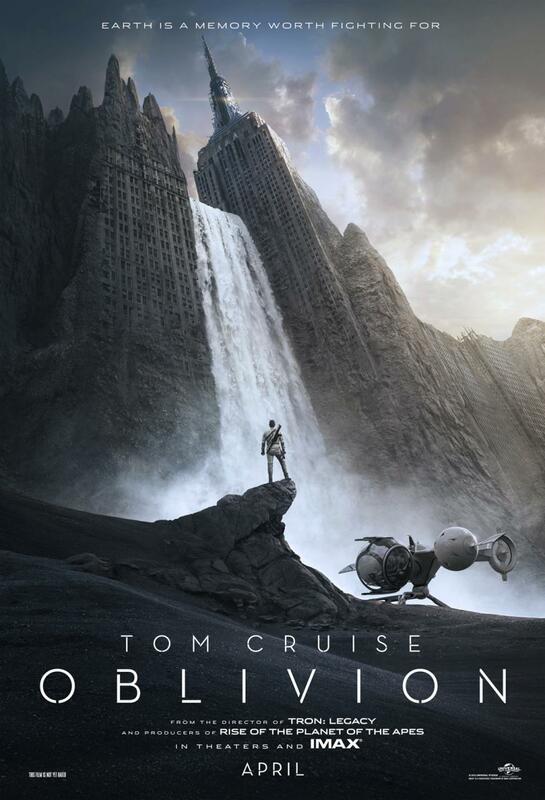 Along with the trailer, the first official poster of the film has been released, showing Cruise’s Harper standing next to his flying vehicle and staring up at what looks like what was once the Empire State Building, but is now a waterfall. Oblivion will be released exclusively in IMAX theaters on April 12, 2013, and will have its wide release into conventional theaters one week later on April 19, 2013. The trailer and poster for the film can be found below. What do you think of the trailer and poster for Oblivion? Will you be heading to theaters this April to check it out? Share with us your thoughts in the comments below.